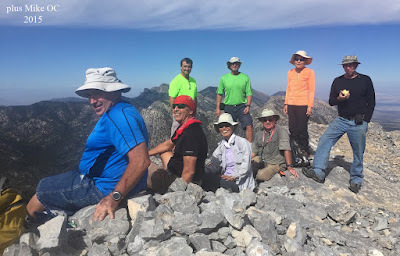 The second climb up to the peak of Mummy's Nose in the Spring Mountains NRA for the summer of 2015 was accomplished on a cloudy morning last week. 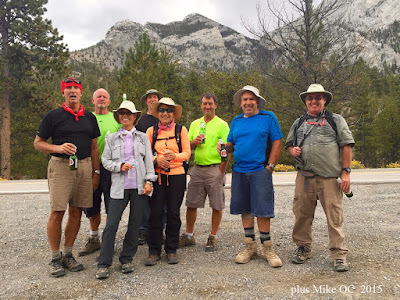 Mike OC sent a few photos and words about the significance of this particular hike. 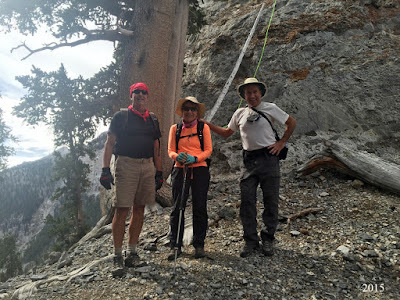 Other photos from a 2012 hike were added to complete the entry. Essentially, the hike begins at the chain-up area on Lee Canyon Road, crosses the road to ascend a dirt road, finds a trail leading up toward the peaks above, drops into a very steep drainage, climbs the drainage to a saddle, turns left to find a 3rd class climb up to the next level, then, finally, completes the climb to the pointy peak where a large group of hikers fits precariously tight. “Climbing is a dance and the mountain always leads.” Any hiker worth his salt knows that you can never one-up the mountain. But occasionally you can exact a little revenge. Earlier in the summer on a warm June morning, Rita took a nasty, headfirst fall just below the summit of Mummy’s Nose. (See where Mark is standing beside the tree in the photo to the left? That’s where she landed. Still gives me chills.) Broken wrist, sprained hand, forehead lacerations and multiple contusions. Twas not a pretty sight. Today, three months later, a determined Rita once again gazed up at that formidable pinnacle, determined to retrace her steps and exorcise those demons. The ascent was steep and grueling, with the occasional loose rock cascading down the slope. 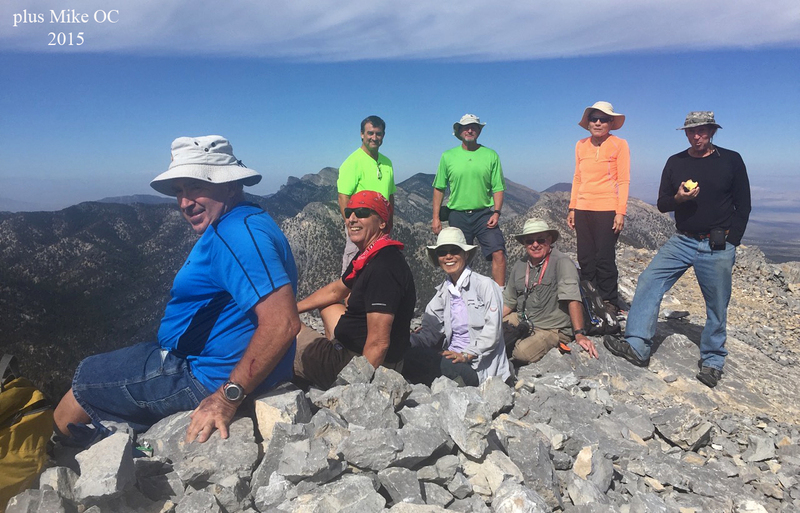 Following a delightful lunch on the summit, we began the long, tortuous descent, carefully dropping down onto the eponymous Rita’s Ridge, the site of the June mishap. And one by one, we stood on the edge of the ridge and stared down into the abyss. Rita may have stared a little longer than most. She called it closure. 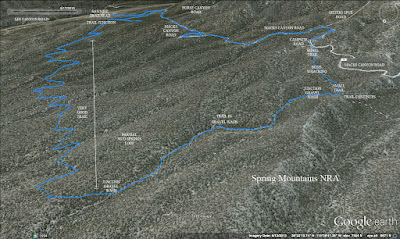 Vitals: 9 hikers, 5 miles, 2800’ vertical, 4.5 hours. Mud Mack Loop is a new route for the club this year. 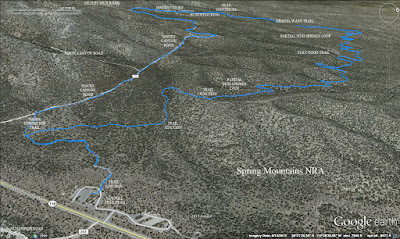 When we first explored this route in the spring, we hiked the trail in a counter-clockwise direction. 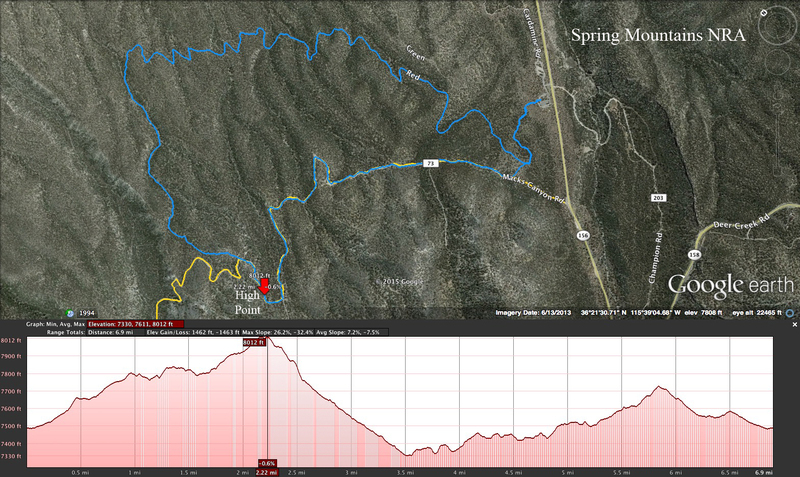 Due to the gravel wash, we decided that the more pleasant direction would be clockwise and that's what we did today. 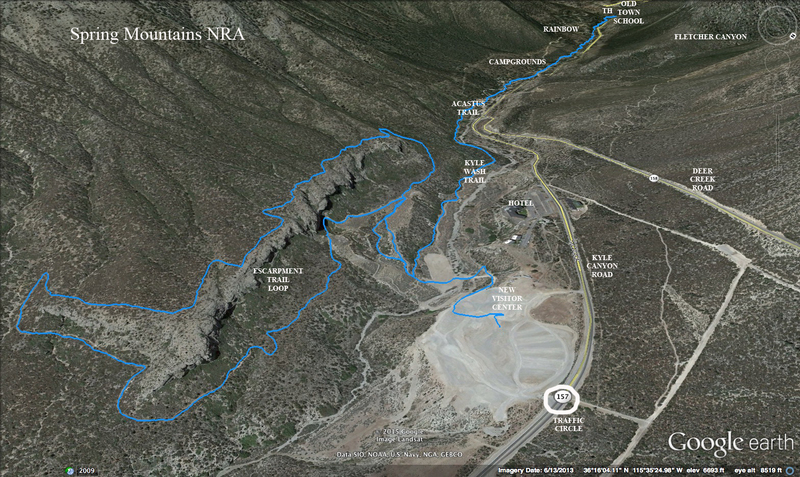 Thirteen hikers arrived at the Sawmill Trailhead on Lee Canyon Road in the Spring Mountains NRA. 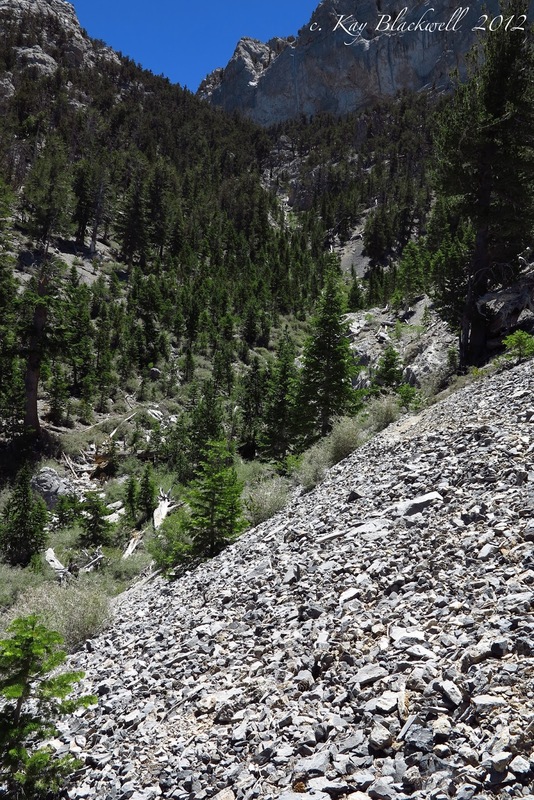 We began our hike on the Yellow Trail that forked to the left. When the trail swung out on a curve, we left the trail to climb up to nearby Macks Canyon Road. We turned to the right on the dirt road and proceeded on a two mile trek up the road. The morning was gifted with a nice cool intermittent wind. Just after the Sisters Spur Road junction, we hiked over the high point of the day. Here, the road dropped down and, at about 1/3 of a mile further, we came to a campsite turnoff that dropped down off the road to the right. We hiked through the campsite at the top of the hill and began bushwhacking down through a maze of washes. Keeping a direct line of progress, we found the Mud Springs Loop (south side) where it was about the climb up to a saddle on the small ridge in front of us. This trail came from the wash we were in and, here, we continued down the wash. Now, we were on the Mud Springs Loop. Our descent through the gravel wash lasted for around 3/4 of a mile. The wash has a few obstacles in the way of overhanging tree limbs. 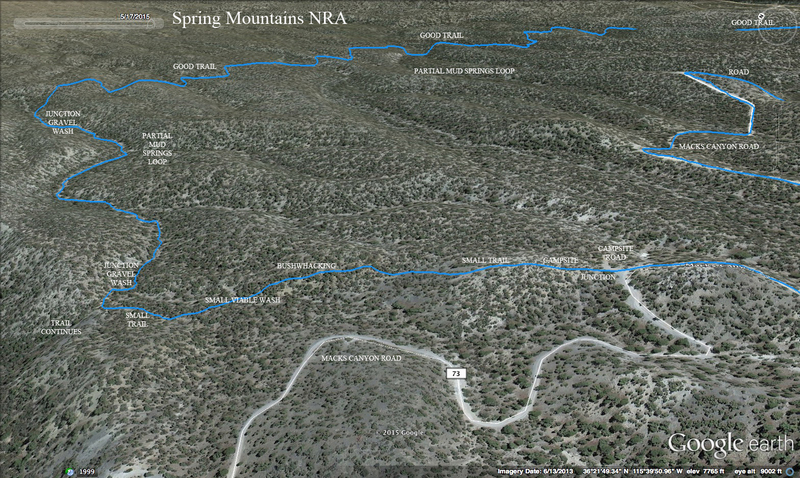 But, since this is also an equestrian trail, at every tree limb, there is a go around trail. The trail (and today's route) comes out of the wash on a well worn path up the hill to the right. 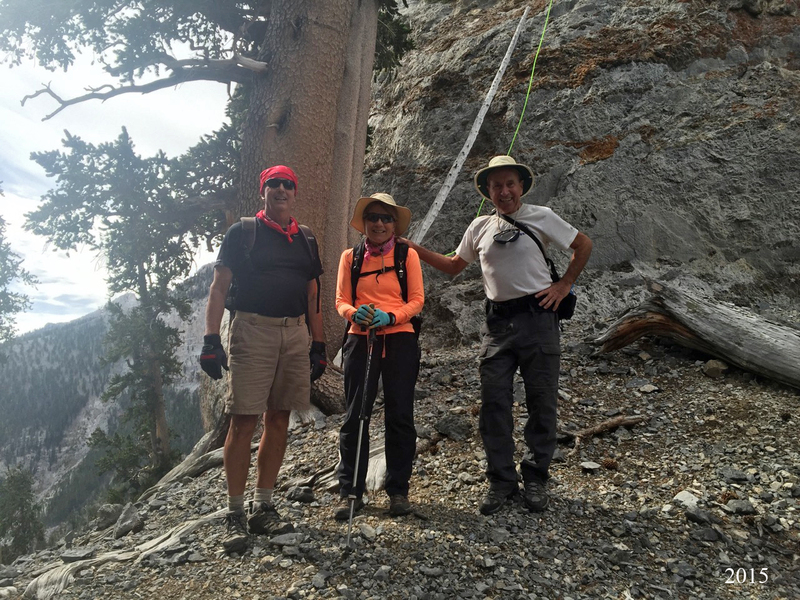 The stick & cairn landmark found in the photo above is found on the left side of the trail. We stopped here for our break at around 3.7 miles into the hike. This was our low point for the day and the next part of the hike would be an undulating ascent of around 450 elevation feet. This is a beautiful forest trail (aka the Sawmill Red Trail) that winds in and out of many washes flowing down from the Spring Mountains Divide to the west of us. The thirteen hikers were a strong group of moderate hikers and the moderate pace was kept throughout the hike. Water breaks and shade breaks were plentiful. 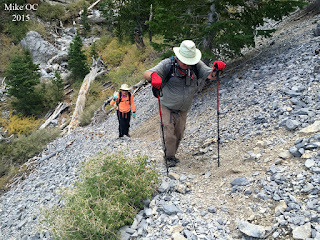 Nearing the Sawmill Ridge (aka Green Trail), our Red Trail became a tad steeper. The climb was a suitable grand finale to the day. 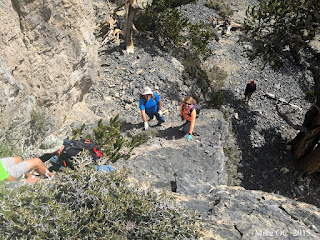 Upon reaching the Red/Green Trail junction on the ridge saddle, we turned right for a mile of cool-down descent back to the cars. It was a very pleasant and relaxing morning's hike. And, it was decided that the clockwise direction is the easier direction to do this route. 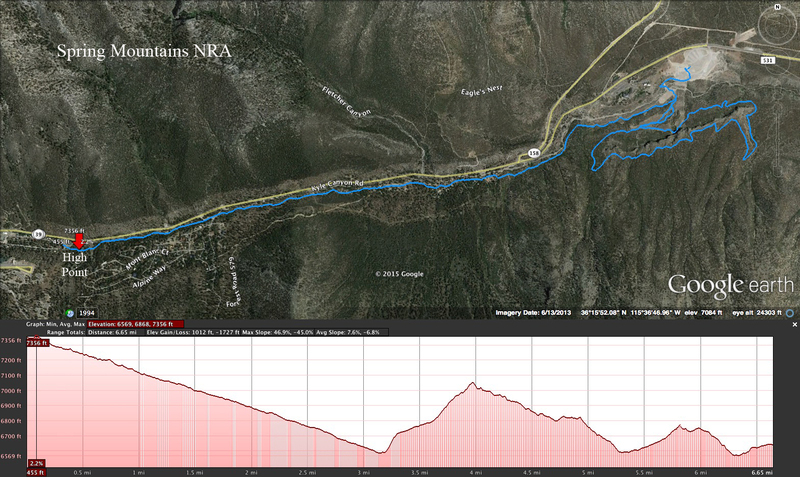 Today's hike was a point to point combination of two hiking routes. 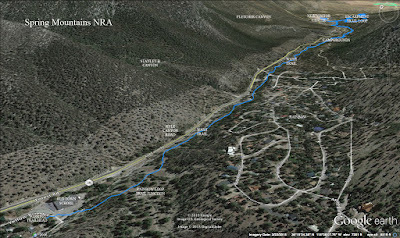 We drove up Kyle Canyon Road in the Spring Mountains NRA, dropped off a car at the Spring Mountains Gateway Visitor Center and found the elementary school within the limits of Old Town. The people there were very nice to allow us to park next to the parking lot at the school where our nineteen hikers began their hike. We crossed the bridge behind the school and followed a trail that led through the woods. The trail passed the Rainbow Loop trail junction then started following the Kyle Canyon wash which is parallel to Kyle Canyon Road. The pace was moderate today and the houses up on the hill to our right in the Rainbow subdivision passed by quickly. 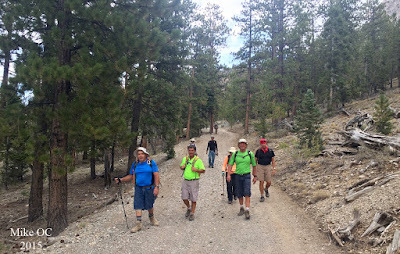 After Rainbow and more of the wash trail, we began hiking through the first of two campgrounds. Here, we stopped for a restroom break for about 5 minutes. The campground was around half full. Next, we passed through the rangers' residence area. Although the old visitor center is still on its foundation, the two dorm cabins were up on flatbeds at the road ready to be towed away. Some construction equipment was busy smoothing the area where they had stood for many years. This beautiful Monarch Butterfly caught the photog's attention in this same area. The next bridge we crossed is only one or two years old and already it is damaged underneath. We passed through the second campground and connected with the Kyle Wash Trail. 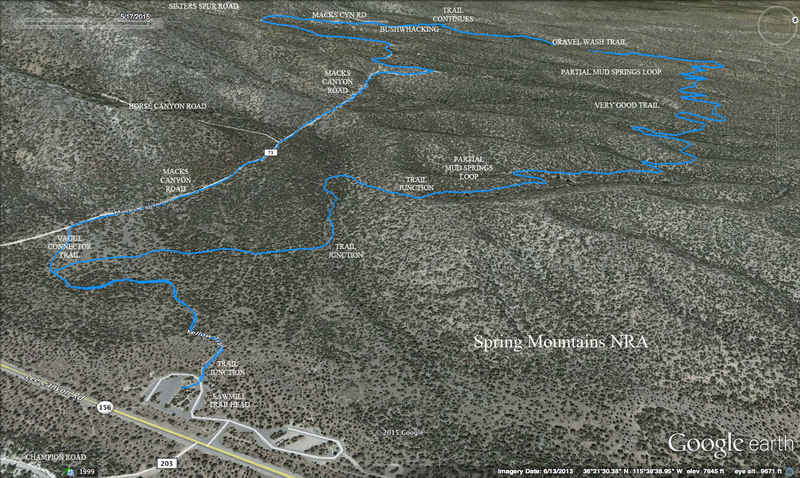 This is a nice wide trail that has interpretive signs and benches along the route. It, too, parallels the wash but a little further away. 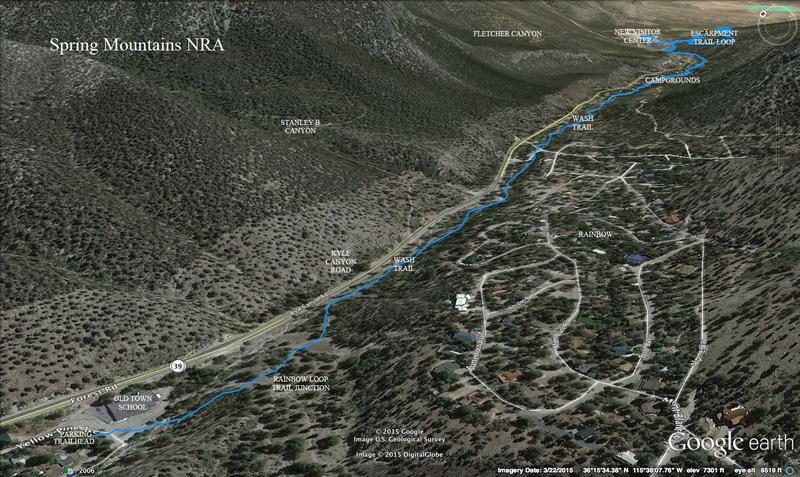 The second half of this trail goes into the area where there used to be a golf course. The old cart paths, over-grown tee boxes and log steps are still in evidence but, for the most part, the rabbitbrush has taken over. The group of nineteen spread out but gathered again each time there was a stop for a water break. The weather was slightly warm with a very nice cool breeze on this first day of autumn. Upon reaching the previous golf course pond site, we started our climb up the hill. A turn to the right put us on a very steep old cart path whose slope we estimated at a 35 degree angle. 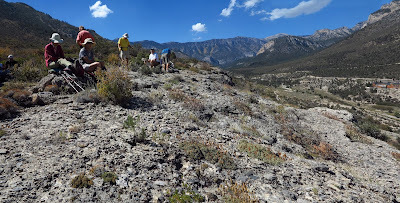 At the first chance to turn right again, we turned onto a dirt trail that began climbing up the west end of the conglomerate escarpment that rises along the mountain across the wash from the new visitor center location. This cemented limestone and other sedimentary rock had several shallow caves lining the bottom of the rock wall. 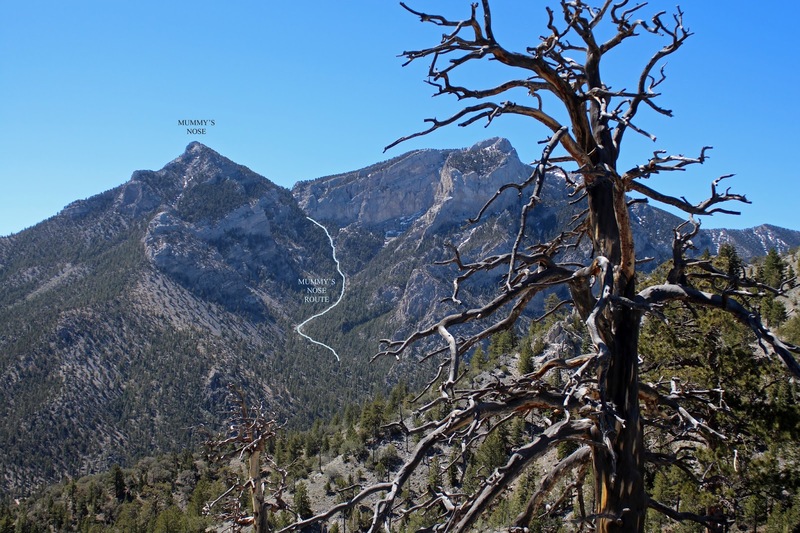 Views of Charleston Peak and the South Loop ridge appeared as we climbed. 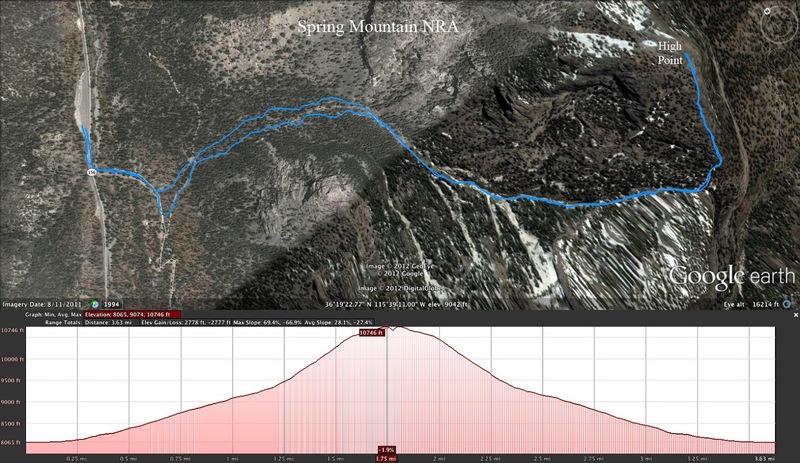 Since most of this hike is downhill, this was the major ascent of the day. When we finally reached the top of the escarpment (after 400' vertical), the trail levels out then starts on a slow descent. 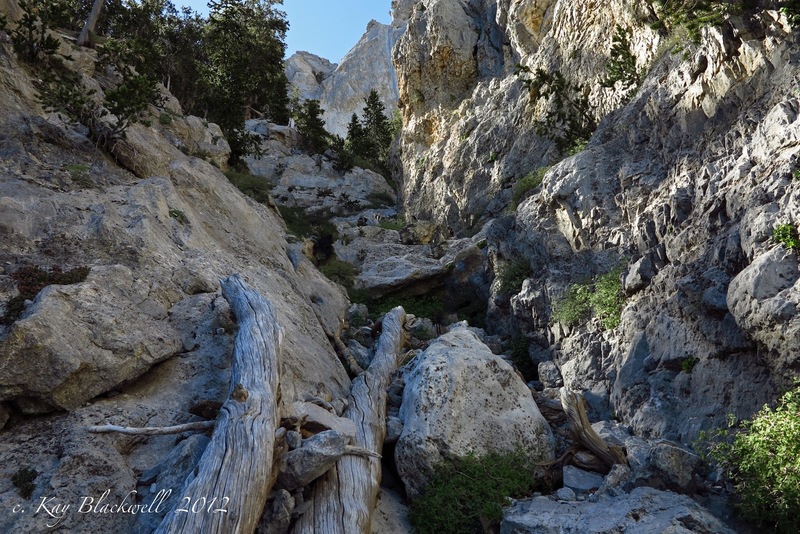 As the trail descends, the long escarpment keeps coming and the views up and down canyon keep out-doing themselves. The mountains have been having cooler night as of late so much of the foliage has started changing colors. The hillside was dotted with everything from bright green to yellow to orange. Then, of course, the aspens on the slopes in the distance provided streaks of yellow, too. Someone has placed a small white flag of sorts on the cliff edge. Not sure what that's about. Our coordinator chose an open area on the escarpment cliff edge for our break. Fantastic! After the break, we continued down the east end of the escarpment following the well-groomed trail. We circled around to follow the bottom of the escarpment now. We had close up views of the caves along the bottom and we wondered what caused the shape of the square one! Marg took over Chris' duty as coordinator for a hoot and we all fell in line. But, as soon as the trail started going up again, Marg relented and Chris returned to the front! When we reached the old cart path again, we decided to turn left. This would increase our mileage by around half a mile as we circled around and down to the visitor center. The cart path led us past the telescope and down through some nice shade next to the rock wall. 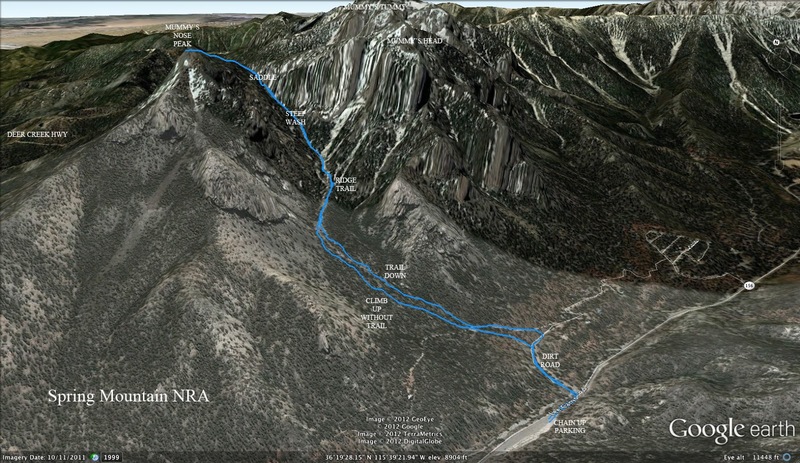 Next, the route led us back to the same steep hill that we climbed earlier. The descent on this hill was much easier! 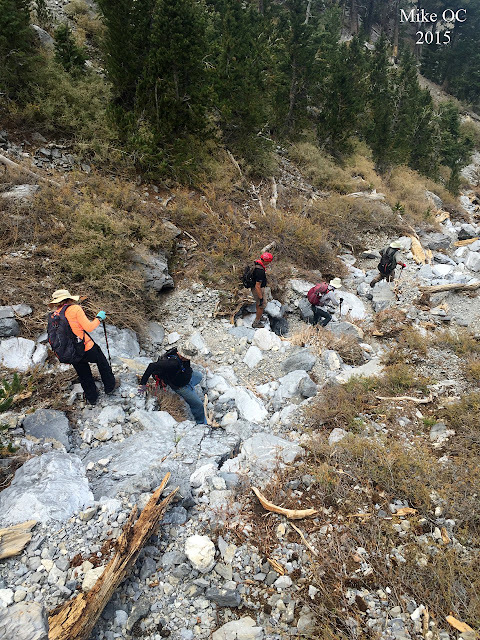 From there, we crossed the old pond site and climbed up to the visitor center. 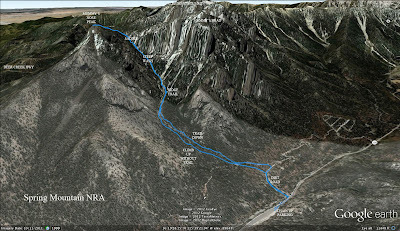 This is a very nice hike that should be done when the temperatures are around 80 degrees or below in the elevation of 7000 feet. There were nineteen happy faces at the end!